Dr. Jeff Adams has been in practice as a board certified orthopedic surgeon for 25 years. He received his undergraduate degree in Microbiology from the University of Tennessee, Knoxville. He graduated from the University of Tennessee Health Science Center in Memphis in 1986 with high honors, and his internship and residency were completed at Carolinas Medical Center in Charlotte, North Carolina. Upon completing his education and residency, it was important to Dr. Adams to be near his parents and his wife’s parents. As a native Tennessean, it made the desire to stay in the Middle Tennessee area even easier. Columbia was a small but growing community at the time, and it was the perfect place to raise a family. After interviewing in several places, Dr. Adams felt his best opportunity for growth was with Mid-Tennessee Bone and Joint. The partners at the time, Dr. Ken Moore, Dr. Eslick Daniel, and Dr. Doug Wilburn, helped sell Dr. Adams on the deal. Professionally, Dr. Adams is extremely proud of how the Clinic has grown into a state-of-the-art facility with outstanding physicians who could practice anywhere in the country, but chose to practice here. 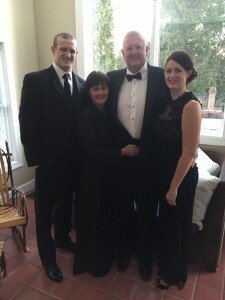 Personally, Dr. Adams is proud of his wonderful family. Dr. Adams is married to Tina Hyatt Adams, a registered nurse. They have two children, Jennifer and Jonathan. Jennifer graduated from Belmont University and is working as a nurse practitioner at Maury Regional Medical Center. Jonathan graduated from the University of Tennessee with a degree in Electrical Engineering, and is now earning his Masters in Business Analytics. Both of his children are graduates of Columbia Central High School. Dr. Adams maintains his ties with the high school sports community by serving as team physician for Marshall County High School, Forrest High School, and Cornersville High School. This season marks his 25th year volunteering as team physician in the area. When he’s not at the Clinic, Dr. Adams enjoys golf, traveling to watch University of Tennessee football, and attending performances at the Nashville Symphony.